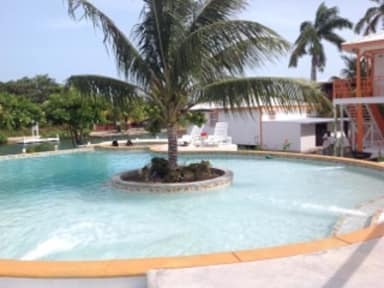 Budget friendly tropical resort waterfront setting with pool and swim-up bar. Hugely popular with backpackers and economy travelers. Rates starting at $20 USD + tax / night. We offer 4 separate classes of rooms. 12 bunk beds in a dorm-style setting or 2 small single and 6 double private rooms with a queen bed, ceiling fans, shared bathhouse with hot and cold water showers, clean sheets, towels (deposit required), shared Living room with 83' TV, cable channels, free WiFi, and all resort amenities. We also offer 6 Suites with two queen beds per unit, A/C, TV with DVD/HDMI, refrigerator, private bath with double sinks, clean towels and sheets and full resort amenities. All Suites are waterfront. We can assist in booking several tours, including fishing, diving and inland Mayan Ruin Tours, as well as golf cart, bike, kayak and paddle board rentals . We are located on Sunset Pointe in the Placencia Village back behind (SW) the soccer/football field. A short walk brings you to several wonderful restaurants, shopping, beach bars and local services. 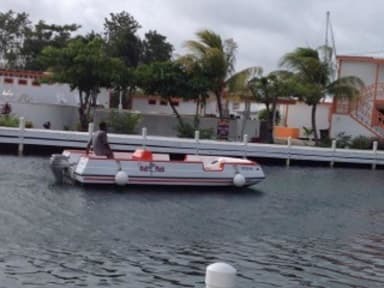 We offer free water taxi service from 5:30 am to 12:00 midnight. Bar is open daily from 12 noon - dark, or later, depending on occupancy. Food menus available from local favorite restaurants to accommodate order-out requests for delivery to the Resort. Must be 18 or accompanied with an adult. Cancellation policy: Cancellations will be allowed up to 7 days before arrival date. Late cancellations or no-shows will be charged the full amount. Payment upon arrival by cash, Visa or MasterCard and debit cards. This property may pre-authorize your credit card before arrival. Water taxi runs until Midnight. $20 BZD deposit for towels.